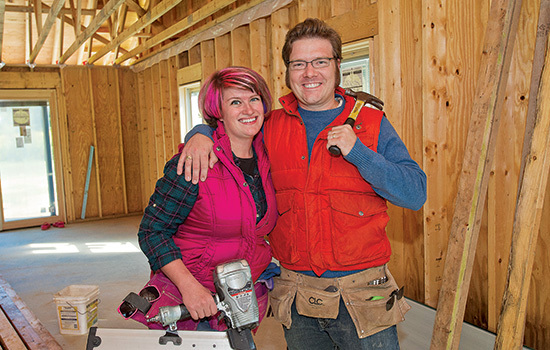 Bethany Choate ’06 and Matthew Heimbueger ’06 are building their own 2,048-square-foot sustainable home in suburban Rochester. The imaging science graduates say the building process has brought them closer together. On weekdays, Bethany Choate and Matthew Heimbueger are scientists. On the weekends, they become construction workers. The 2006 imaging science graduates are building their own sustainable home on 28 acres in the Rochester suburb of Rush. “We always knew we did things somewhat unconventionally,” Choate says. The two first met in AP Chemistry class at Rush-Henrietta High School after Choate had completed an internship at RIT’s Chester F. Carlson Center for Imaging Science. She liked it so much that she encouraged her classmates to apply. Heimbueger did, and after he completed it, he was able to continue working part time the following summer. By that time, Choate was an RIT student and they reconnected. “I had other plans for my birthday that fell through and I ended up at his graduation party that happened to be on my birthday,” Choate says, adding that a group trip to Niagara Falls later that summer sealed the deal. They were married five years later on June 28, 2008. Last fall, Heimbueger, who works as a senior laboratory engineer at the University of Rochester Laboratory for Laser Energetics, and Choate, senior associate for outreach and communication for the Center for Imaging Science at RIT (which includes coordinating the same internship program they both attended), decided to build their own home. Choate’s parents, who live on the lot next door, gave them the land. They attended the local Greentopia Festival to get some ideas about building a sustainable and efficient structure. Then, with the help of Choate’s dad, Albert, who built his own house in the 1970s, they drew up some plans. Heimbueger says they didn’t start out planning to build the house themselves. The house will have solar panels on the roof and use geothermal energy. They worked hard to plan their energy consumption and production to come out to net zero.